Adrian Flannelly (right) broadcasting from his New York studio with former New York City mayor Ed Koch. He is Adrian Flannelly, host of his own radio show, which is broadcast internationally each week and has been on the air continually for the last 50 years, bringing listeners a mix of music, international and national news, culture, economic developments, commentary, interviews with musicians, writers, politicians, and statesmen including presidents of the United States and Ireland. Paul O’Dwyer, Bruce Morrison, Niall O’Dowd, and Adrian Flannelly take part in an on-air discussion of the Morrison Visas. Born in Attymass, County Mayo, to Pádraic and Linda Flannelly (née O’Dwyer), who were both schoolteachers, Adrian Flannelly immigrated to the United States in 1959, when he was 17 years old. Luckily, he happened to already have family members in the States, and some notable ones at that. William O’Dwyer, Flannelly’s uncle, had been the 100th mayor of New York City, the city’s first Catholic mayor, and had subsequently been the United States ambassador to Mexico, appointed by President Truman. 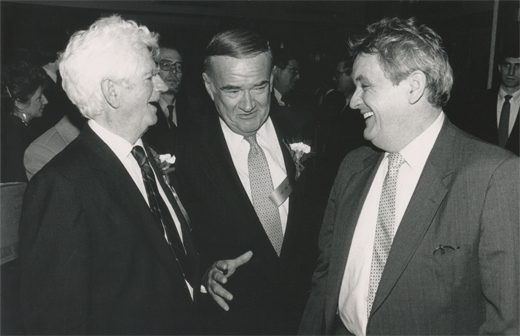 Paul O’Dwyer, William’s brother, was a renowned civil rights activist and former New York City Council president. Paul sponsored Flannelly to come to the United States and helped him get a job as a piano player in Mickey Carton’s Irish band. 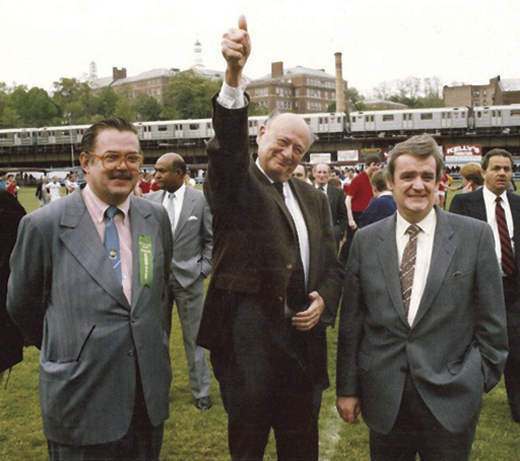 Adrian with New York City’s former mayor Ed Koch. 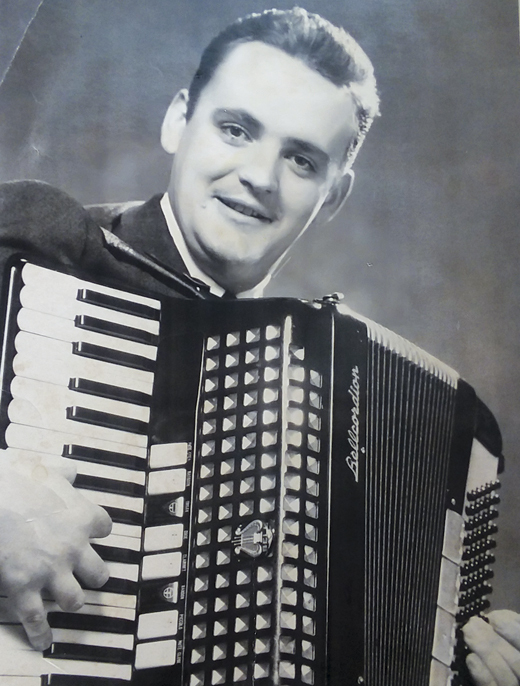 Adrian launched his first radio show in 1969, a decade after emigrating from Ireland. As time passed, he stayed with the music scene but dove deeper into politics and social issues facing the Irish in America and back home. 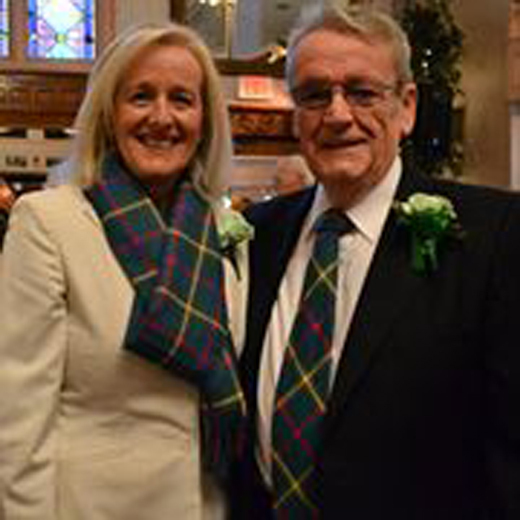 Adrian and his wife, Aine Sheridan, were recipients of the 2012 Holyoke St. Patrick’s Parade Committee’s Ambassador Award. 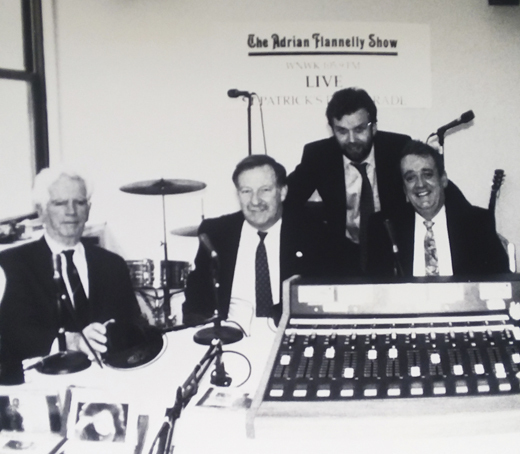 “I began to see the radio show as a conduit for change and a way to shed light on issues concerning the Irish-American community – especially when it came to U.S. immigration reform and the visa lotteries,” Adrian says. He became a major force on behalf of applicants during the Donnelly and Morrison visa programs, even filling up a truck with thousands of applications from Irish immigrants and driving with his daughter, Linda, to Washington and personally delivering the applications for visas to the government lottery. He was also co-founder of Project Irish Outreach with Monsignor James J. Murray, Director of Catholic Charities, Archdiocese of New York. His efforts resulted in legalizing thousands of undocumented Irish immigrants in the United States in the 1980s and 1990s. In response to his initiative, the Irish government appointed Flannelly in 2000 as the U.S. Representative on its task force on “Policy Towards Emigrants,” an initiative of former Taoiseach Brian Cowen. Adrian soon after his arrival in New York. Locally, Flannelly had a particular knack for making friends with successive mayors of New York City, who always held out the welcome mat for him at City Hall. Mayor Koch was often heard singing the song “New York, New York” at Irish events, with Adrian accompanying him on the piano, and Koch never failed to credit Adrian with helping him with the Irish vote. Mayor Michael Bloomberg called Flannelly his “good friend” as he appointed him Irish Cultural Liaison to City Hall. As such, Flannelly organized Bloomberg’s three trips to Ireland, including to Belfast in May of 2008 for the U.S.-Northern Ireland Investment Conference, where Bloomberg was a keynote speaker. 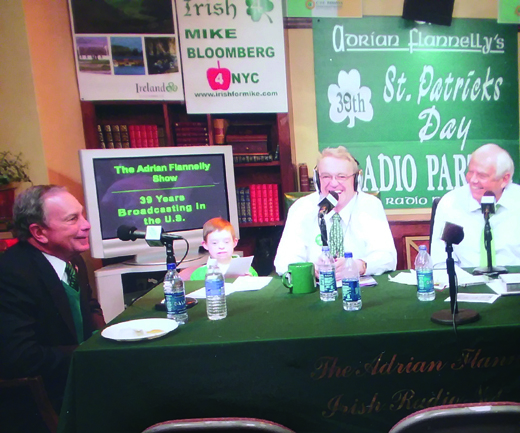 Adrian and Aine’s nephew, Daniel Gasiewski, sits in on an interview with Michael Bloomberg and John Dearie. Adrian also serves as the Irish Cultural Liaison for the Irish Hunger Memorial in Battery Park City, adjacent to the World Trade Center and World Financial Center. The recreated famine cottage that sits on the half-acre site is a major attraction for millions of visitors to New York City since its opening in 2002. The cottage was transported from Adrian’s native parish of Attymass, County Mayo. Adrian’s voice is recorded on a guided tour of the memorial, in which he explains the history of the famine that ravaged Ireland from 1847 to 1852. He attributes a great deal of his success to his wife, Aine Sheridan, who is not only his partner in life, but also his partner on the show and on irishradio.com. Born in Edgeworthstown, County Longford, Aine is also the executive assistant to the chairman of Capital Management LLC at Mutual of America Life Insurance Company. She joined Flannelly Promotions Ltd. as executive vice president in 1991, where she expanded the show and initiated international broadcast links. Aine has been named one of the “Top 50 Power Women” by Irish America and one of the “Top 50 Most Influential Irish American Women” by the Irish Voice. Aine was also voted “Woman of the Year” by the Emerald Isle Immigration Center in New York, of which both she and her husband are on the board. Adrian’s other great supporters are his children, Linda, Paul, Eileen, and Kathleen, and his four grandchildren. 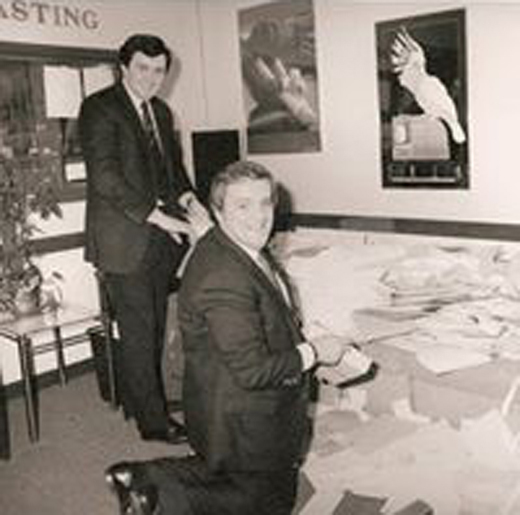 Adrian, pictured in his studio with Congressman Brian Donnelly, counting Donnelly visa applications. Adrian himself has no shortage of accolades. Honored as “Man of the Year” by seven organizations in seven distinct years, namely: the Ancient Order of Hibernians, the Irish Business Organization of New York, the American Irish Musicians Society, the Emerald Society of the NYPD, the Irish Examiner USA, the New York City Board of Education, and Ambassador of the St. Patrick’s Day parade, Holyoke, M.A. To cap it all off, Quinnipiac University awarded Adrian an honorary doctorate degree in Humane Letters in 2016. (From left): Adrian’s cousin, Paul O’Dwyer; Adrian himself; and Mike Rafferty at Irish America’s Top 100 event. Add modesty to the long list of commendations for Adrian Flannelly, because a radio show does not run consistently for 50 years and garner such acclaim without a substantial amount of discipline, although Adrian might call it plain stubbornness! Click below to see Adrian Flannelly’s remarks upon his induction into the Hall of Fame, at the Pierre Hotel on March 14, 2019.